Right posterior well defined apical opacity. (cervicothoracic sign). Schwannoma? 1. Right well defined apical opacity without deviation of trachea or hilium displacement, without rib involvement, but with tiny chain-like shadow, which I belive is post-surgical. 2. 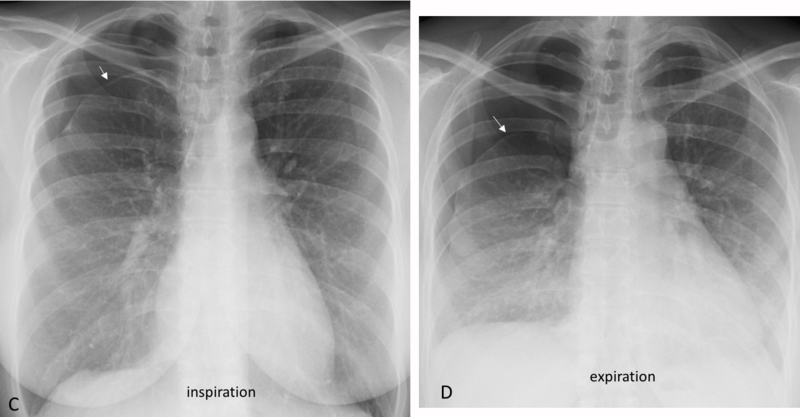 A little bit of pleural thickening between III and IV rib on the right which would be consistant with post-op. 3. Poorly defined opacity between right apical opacity and right hilium. 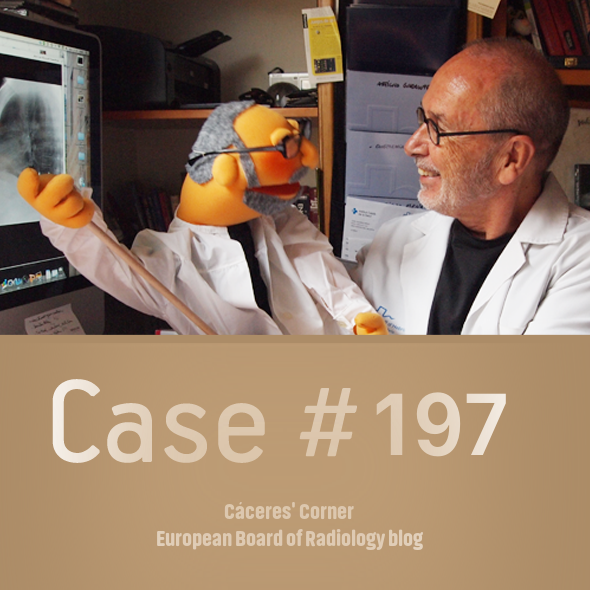 There might be calcified lymph node there, but it also could be something surgery related. 4. Right heart border blurring, but since patient goes to knee surgery she probably isn’t ill, so I’d go with pectus excavatum. 5. Little roundish shadow overlaying II left rib that might be in soft tissues. Rt hemithorax apex opacity, posterior (cervicothoracic sign). 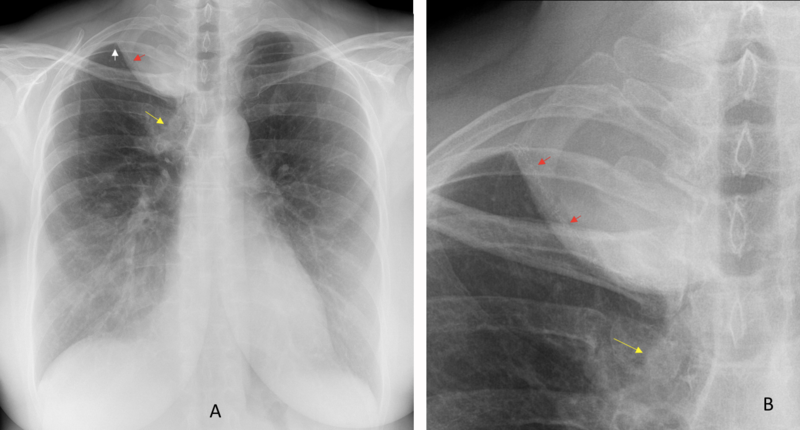 Remodeling of 2nd and 3rd ribs, which points to a slow-growing lesion. I’d go with a neurogenic tumor (neurofibroma or schwannoma). Boarded base radioopacity with well defined posterior and lateral border and ill-defined upper border – seen in the right upper hemithorax. No deviation of the trachea. 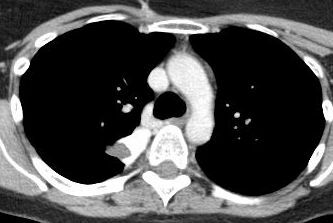 The right paraspinal line not well made out – Superior mediastinal mass. soft shadow right apex with very sharp rounded inferior border. 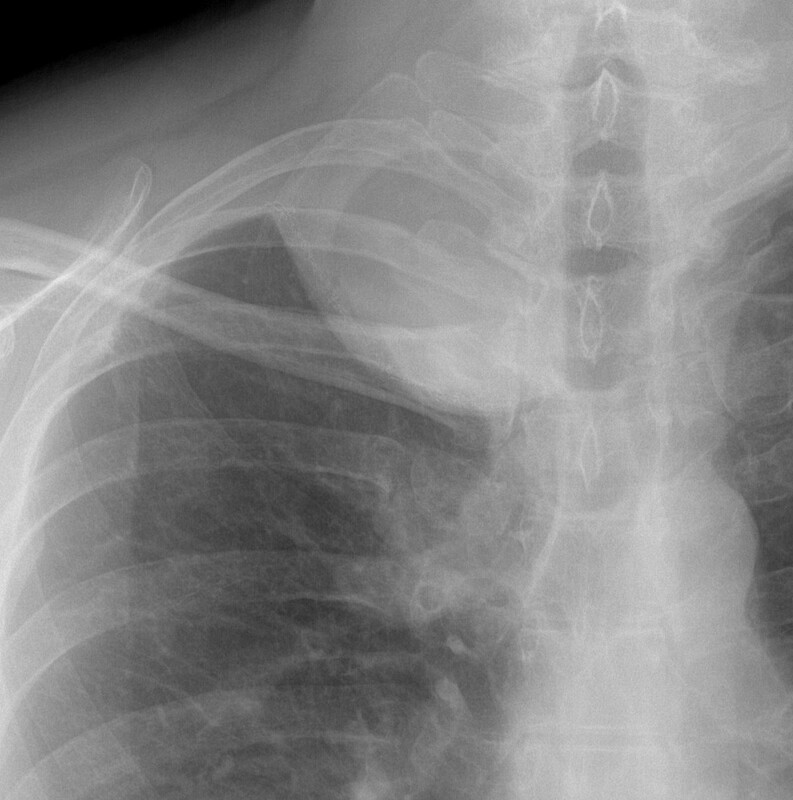 possible 2 small areas of pleural thickening adjacent rt 4th rib. Well defined soft tissue density lesion projected over the right lung apex. Very sharp lateral and inferior margins without a clearly visible upper border or medial border. Central trachea. Lung volumes preserved. Can’t see any bony destruction. Posterior mediastinal or cervical mass (thyroid mass with retrosternal extension). I’ll go for a nerve sheath tumour as the most likely diagnosis. 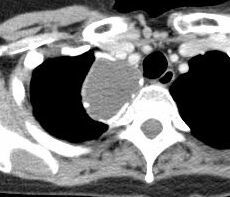 Compare with previous imaging and advise CT for further assessment. right apical pleural-based soft tissue mass with right hilar enlargement, no deviation of the trachea or apparent bone erosion. Pancoast tumor with rigth hilar lymphadenopathy. 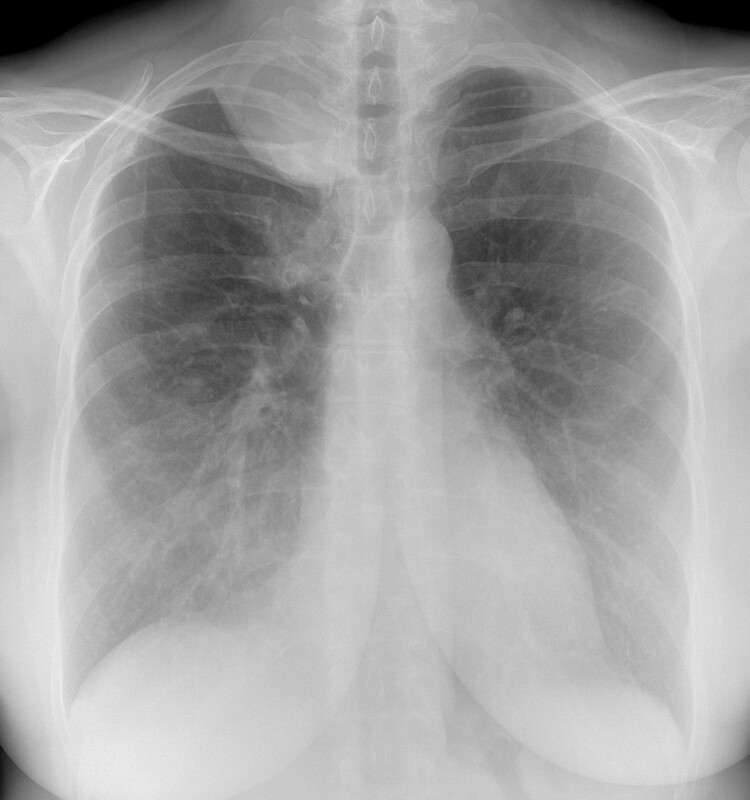 the lesion seems to have a fluid-density with a well-defined round margin that seems to show some contrast enhancement and forms acute angles with the lung; with several peripheral dot-like and linear hyperdensities (vessels or calcification), the caudal end of the lesion seems to be located within the lumen of a distended enhancing vessel (azygos vein?). Impression: lesion of vascular origin (thrombosed aneurysm azygos vein?.. ), coronal and sagittal reformation might help.